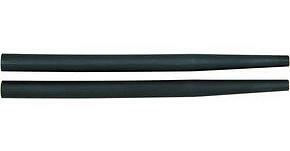 Ahead Drum Sticks features an Aluminium Core with replacable Tips and Sleeves. They are known to be very durable and feel superb for fast single strokes. Endorsed by Lars Ulrich (Metallica), Tico Torres (Bon Jovi), Phil Rudd (AC/DC), Jim Keltner and many more. A best selling drumstick that is short and light-weight. Great for Jazz or lighter playing. ​A best selling drumstick that is light-weight and fast. Great for all musical styles. The best of both worlds with a 5B handle and a 5A shaft, providing great balance, speed, performance and 5A articulation. Ideal for those who want a larger grip. One of our longest lasting drumsticks that provides durability for the heavy hitter. This drumstick is the same size as the 5B drumstick, yet weighs slightly more. A longer 5A drumstick with more reach, power and articulation. Designed specifically for Phil Rudd and a demanding AC/DC performance. A fast and powerful drumstick with extended reach and durability. Designed for Tico Torres' legendary playing style. Lucky Lehrer's Black on Black on Black drumstick designed for speed and punk rock. A light-weight and fast drumstick with plenty of power. For SST, ST, MT, LT.
A best selling wood fiber bundle drumstick that provides maximum durability and good articulation at lower volumes.